Our last day in France was quite an adventure. After a walk to the local boulangerie for fresh bread and pain au chocolat, we ate breakfast at our gite before driving into Bourg d'Oisans one last time for the Saturday market. After strolling through the market and drinking coffee in a sidewalk cafe we had a fabulous pizza lunch and then drove to our airport hotel in Lyon. Since it was only 4 pm we decided to take the train into Lyon to visit the old city, which was surprisingly charming. We enjoyed a stroll through the narrow old city streets and then had a fabulous Italian dinner in a quaint little square (I had a gnocchi tartaflette with ham and creme, which was fabulous). 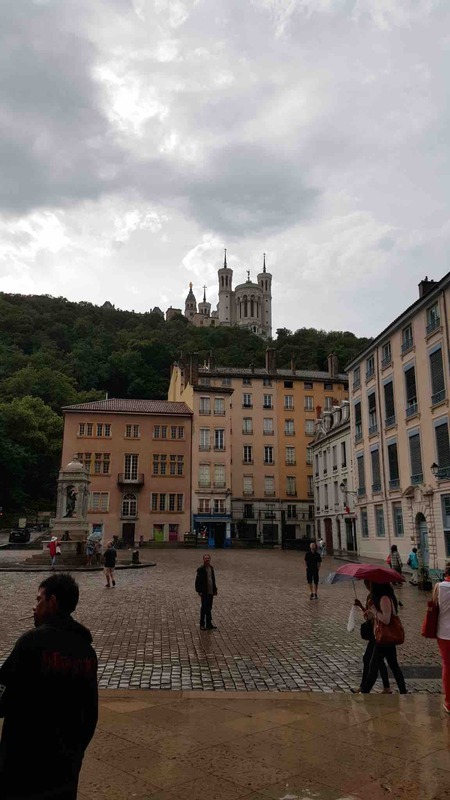 We decided to "walk off dinner" by walking from the Old City to the train station in Part Dieu, about a 45 minute walk, but when we arrived we were told that there was a problem with the train and that we needed to take the subway to the next train station. After a short walk back to the subway station, we descended into the station to find it incredibly hot and humid. When the subway arrived it was packed with hot and sweaty passengers, and let's just say it was somewhat unpleasant. Fortunately we were on that subway for only two stops before switching lines to a much less crowded and more pleasant subway car. When we finally reached our destination we emerged to a downpour, which provided a much-needed shower after the subway experience. By the time we reached the hotel it was after 10 pm and we had to get up at 4:30 am for our early flight home! Here are pictures of Val and Tim in front of our gite in Allemond and the church square adjacent to the old city of Lyon.